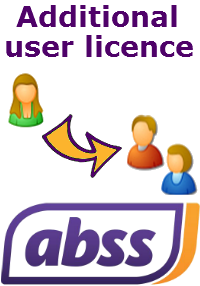 Additional user licences for ABSS Premier or ABSS AccountEdge. You may purchase this with the full pack, or if you already have an existing licence. Additional user licences enable members of your organisation to concurrently access ABSS and make updates. This is useful to streamline your work processes and ensure efficiency. For example, sales could be entering invoices while purchasing is ordering stocks from suppliers and finance is processing payments. All these tasks can be performed concurrently with multi-user licences. The additional user licences come in packs of 2 users. Note that additional user licences are activated online. No physical product will be delivered to you. Once your order has been processed, you will need to re-confirm your company file and the additional user licence will be activated.